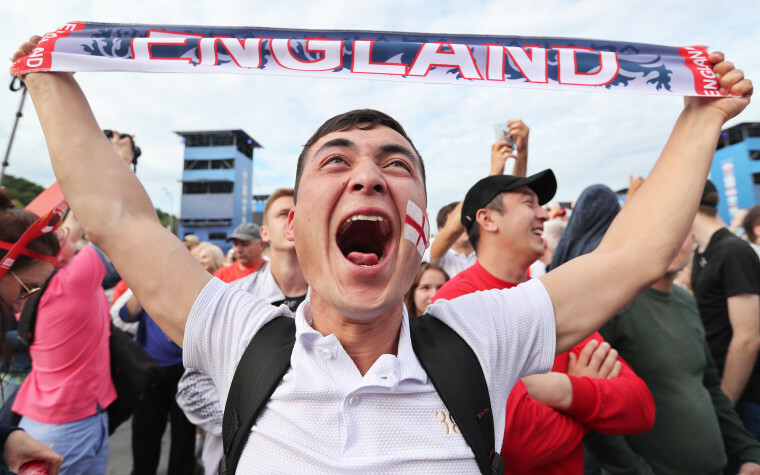 Given the dour national mood, it’s no wonder the World Cup resonates so powerfully with English fans this year. As inevitable as the tides, the dawning of a new day brings another crisis for the British government. Prime Minister Theresa May’s efforts to hammer out a concrete vision for Brexit on July 6 have so far resulted in predictable chaos, with a slew of resignations from hard-line Brexiteers including Foreign Minister Boris Johnson and whispers of a leadership challenge in the corridors of Parliament. Our politicians are a global laughing-stock; the economy is stuttering; we’ve entered an eighth year of austerity with no end in sight. And yet, for many of us, it has all momentarily ceased to matter. Instead, we’re focused on ironing our lucky pants and navigating the fastest route from our workplace to the pub. Because today England faces Croatia in its first World Cup semifinal match in almost three decades. Our politicians are a global laughing-stock; the economy is stuttering; we’ve entered an eighth year of austerity with no end in sight. And yet, for many of us, it has all momentarily ceased to matter. And boy, do we need something to cheer about. In the wake of 2016’s Brexit referendum, Great Britain is often painted as a divided island. But no part of the country is so wracked with partisanship and self-doubt as England. More than any other constituency, it was English voters, principally in the Midlands and the north, who voted to leave the European Union, and it was England’s sense of wounded national pride — expressed in its mourning over a lost sense of “sovereignty” and its atavistic whimsy for an imperial past — which fomented anti-EU sentiment. On the other hand, it was English voters, too, predominantly in the cities, who most categorically rejected the Brexit premise. Indeed, a pro-EU demonstration in June in London drew thousands of marchers to Parliament Square. Given this dour national mood, it’s no wonder the World Cup has such resonance this year. For England, the competition is no longer just an opportunity to fulfill the plaintive refrains of a nationwide dream to end “years of hurt” and see “football coming home.” It is a respite from political chaos, and a chance to resuscitate a national identity shattered by two years of post-Brexit acrimony. This year's World Cup progress has arguably become a rallying point for a country struggling to remember what it is, and what it wants to become. This year's World Cup progress has arguably become a rallying point for a country struggling to remember what it is, and what it wants to become. For all its humiliating lack of success in the years since it last lifted the World Cup in 1966, England still retains a sense of ownership over the sport of football, the game whose modern incarnation it codified in the late 19th century. Today’s Premier League, which has evolved out of a league originally founded in 1888, has become one of the most successful cultural exports in the world. But the patriotism that undergirds England’s forays on the international stage is not without baggage, as the flag that the national team play under symbolizes all too well. In the late 1970s, the English flag, a red cross on a white background known as the George Cross, was co-opted by The National Front, a forerunner of the many Britain First-style factions that President Donald Trump occasionally likes to retweet. This association turned the flag toxic, transforming it into a symbol of a hooligan sub-culture entirely out of step with the country Britain’s political architects, and much of its population, sought to build. A little over two decades ago, international football was the catalyst for the flag’s rehabilitation, however. In 1996, when England hosted the European Championship, some blistering performances by the home team at Wembley presaged the optimism and "Cool Britannia" swagger of the late 1990s. Although England would eventually be defeated in a semi-final penalty shootout with Germany, the renewed sense of national pride endured. In the years that followed, English identity tilted towards the liberal consensus that drove its politics. And for a few weeks every couple of years, whenever a major international football tournament got underway, patriotic fervor became temporarily acceptable in polite society, provided the pride was about what the country had become — liberal, globalist, progressive — rather than what it once was. If Brexit was principally an inchoate scream of disaffection against the status quo, then it was also a rejection of the modern (liberal) identity. “If you believe you’re a citizen of the world,” said Theresa May in her first party conference speech as prime minister, channelling the new mood, “you’re a citizen of nowhere.” As concern about immigration gave rise to a tub-thumping nationalism, English patriotism reassumed its old belligerence. The flag, like memories of empire, has once again become a pawn in England’s ugly culture wars. For the liberal side of the national conversation, patriotism in the hands of the Daily Mail and the reactionary contingent of the Conservative Party can seem a vulgar, even dangerous, thing. Unsurprisingly, those of us who feel ashamed of the empire’s exploitative history have grown leery of national pride in any form, and thus less likely to drape ourselves in the cross than we are to tease English bigots by pointing out that Saint George was an immigrant. The question is, can this trend be reversed once again? Even now flags are reappearing: affixed to car windows, hung from the window of an upper-floor flat, in bunting draped from the eaves of a pub. England’s quarter-final victory over Sweden is believed to have been watched by a TV audience of 20 million; CCTV footage at the time of kick-off shows national freeways devoid of traffic. This week’s news of government meltdown saw thousands of people calling for the England manager Gareth Southgate to be made prime minister or, in several instances, king. Even if English team captain Harry Kane does end up hoisting the World Cup trophy this Sunday, the victory will be, of course, nothing more than very a temporary reprieve from the nagging existential questions that will define England’s future. But for as long as this World Cup adventure continues, the country must appreciate what we so recently took for granted: pride, togetherness and a sense of belonging. Henry Wismayer is a writer based in London. His essays and features have appeared in over 70 publications, including the New York Times Magazine, Washington Post, and The Guardian.